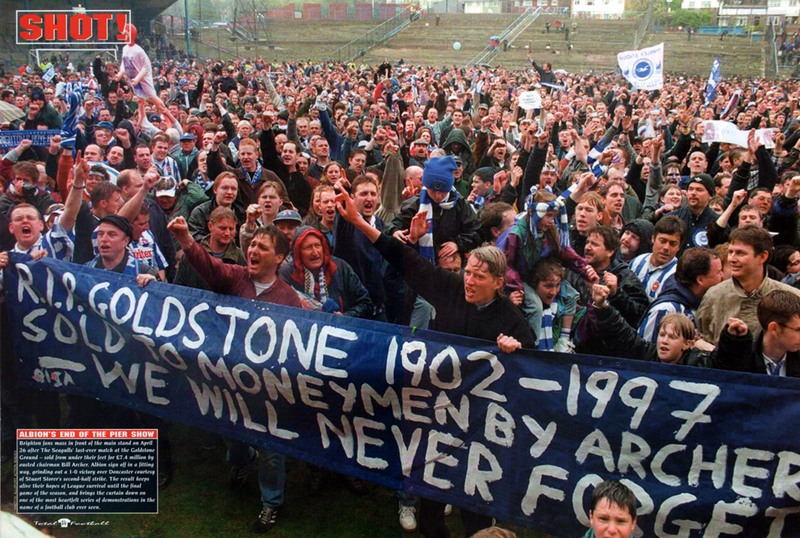 Rioting fans forced Brighton’s match with York to be abandoned yesterday as hooliganism returned to blight English soccer – six weeks before the start of Euro 96. The trouble – which followed a rampage by Dutch and German fans in Rotterdam four days before – was witnessed by the FA’s head of security, Leslie Walker, and will force a major inquiry. Several supporters were injured and a woman was carried away on a stretcher atter being hit by a missile. Hundreds of angry Brighton fans ran on to the pitch after 16 minutes’ play to protest at the sale of the Go1dstone Ground and the Second Division club’s plan to groundshare with Portsmouth. 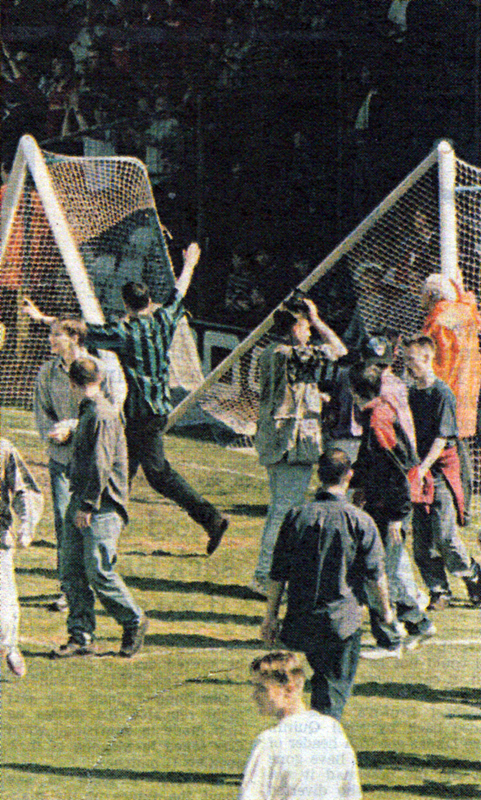 Goalposts were pulled down and an attempt made to storm the players’ tunnel, with wooden stakes and corrugated plastic ripped up anti-thrown. Police reinforcements arrived to restore order but by this time referee Ian Hemley had called the game off. Five fans were later charged with criminal damage. Rampaging fans turned Brighton into a war zone yesterday in sickening scenes that shamed soccer. 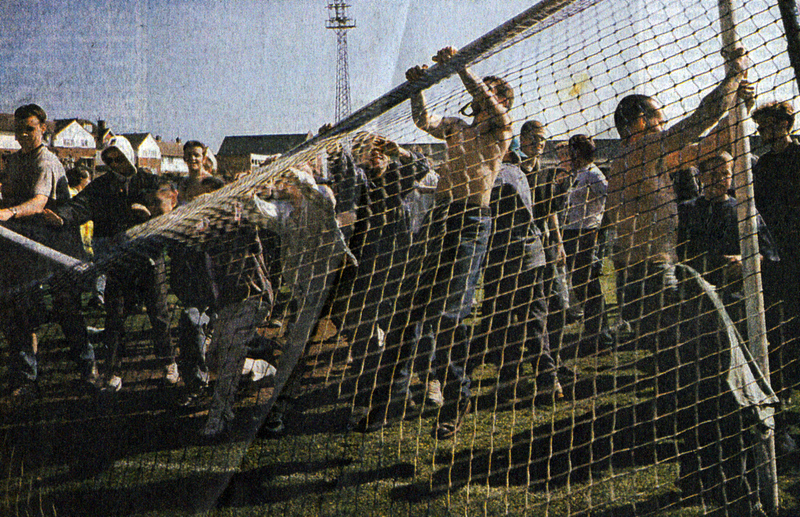 The Goldstone Ground erupted into violence as thousands of fans stormed across the pitch – smashing both sets of goalposts and forcing the game against York to be abandoned after just 16 minutes. Riot police battled to control the mob, and one injured fan was stretchered to hospital as advertising hoardings and metal billboards were hurled into the stands. FA director of communications David Davies last night promised an immediate investigation. After swarming on to the pitch, fans charged up the players’ tunnel and attempted to smash into the dressing rooms. 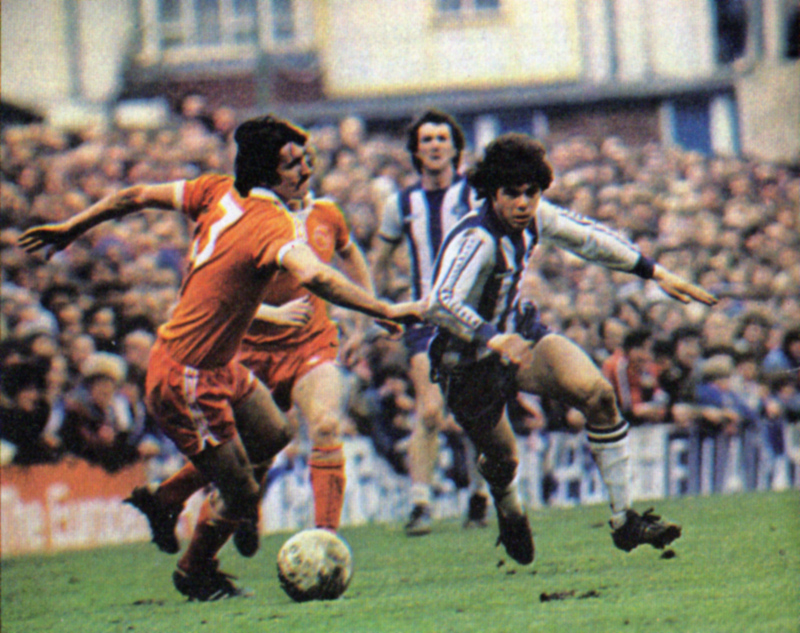 The dug-out and tunnel were wrecked as fans screamed for the men who run Brighton – David Bellotti, Greg Stanley and Bill Archer – to quit. The match was eventually replayed, surprisingly not behind closed doors. It took place on the morning of Thursday 9th May as an all-ticket match with tickets only available on the day before. A gate of 2,106 saw Albion lose 3-1. 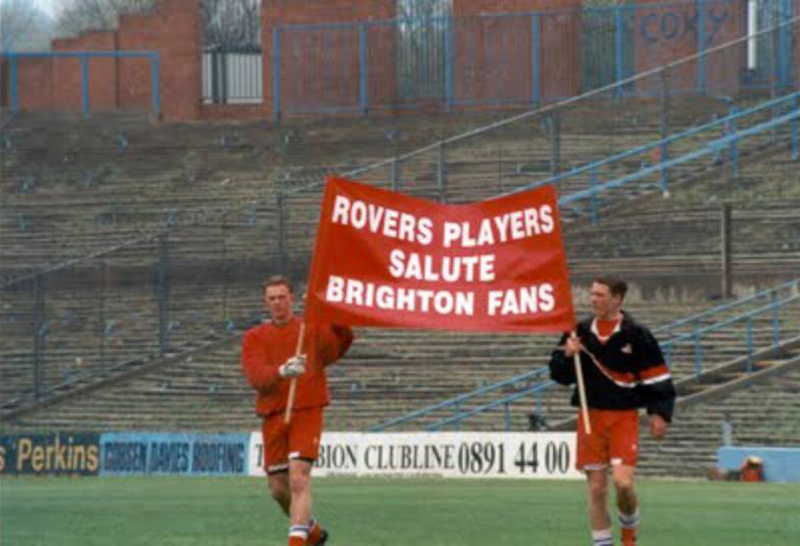 Brighton also incurred a suspended three point deduction, two of which were docked after another pitch invasion, on Tuesday 1st October 1996, in the match against Lincoln. Peter Ward, Brighton’s scoring bombshell, is still learning to adjust to the fact he has actually made it into the ranks of professional footballers. You can’t really blame him either – he had grown used to people saying he was far too small ever to make the grade. He sayS: “l always wanted to be a footheller, but so many people told me I was too small that I began to believe them. I never even got a game for Derby Schoolboys – my home-town – because they reckoned I was too tiny. 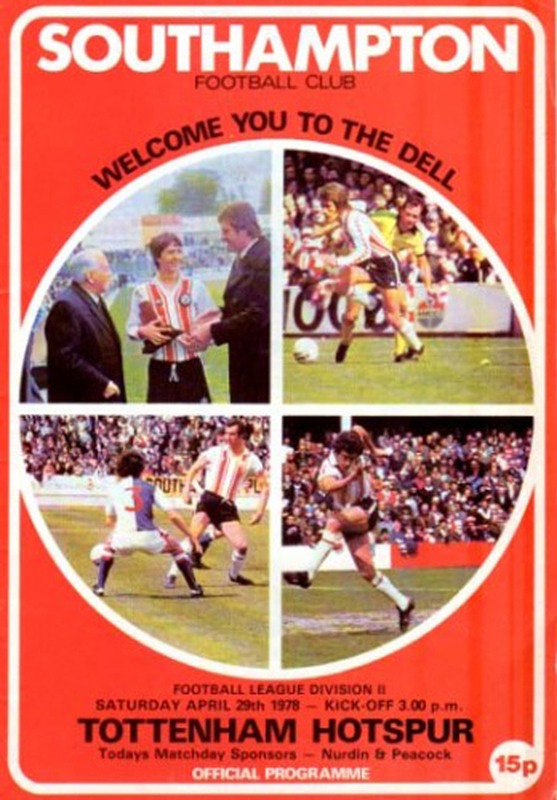 So, with the League clubs definitely not beating a path to his front door, Peter decided to become an apprentice fitter and to simply concentrate on playing for local League sides in Derby. But the years brought extra inches and pounds – and, finally, his big opportunity. Neighbouring Southern League club Burton Albion spotted his potential and snapped him up when he was 18. Peter proved them right by grabbing 26 goals in his only season with them. 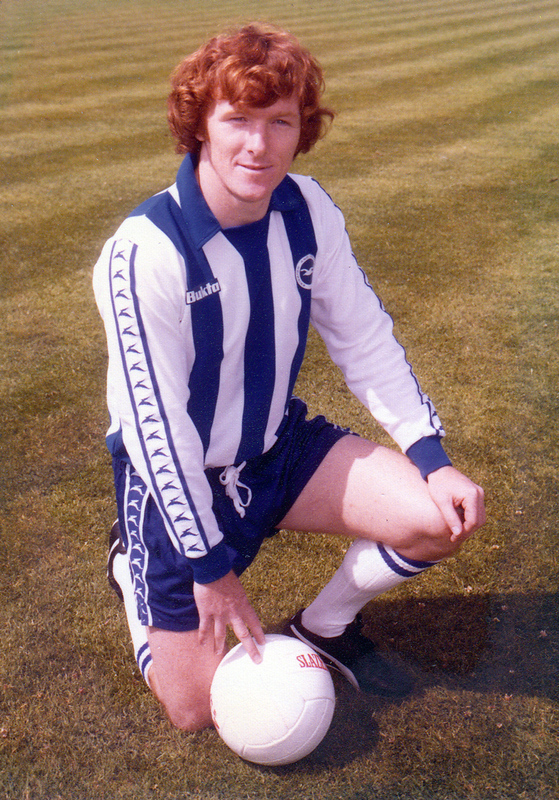 Then Brighton boss Peter Taylor, no stranger to the area, heard of his skills, went for a look – and promptly signed him for £4,000 last year. 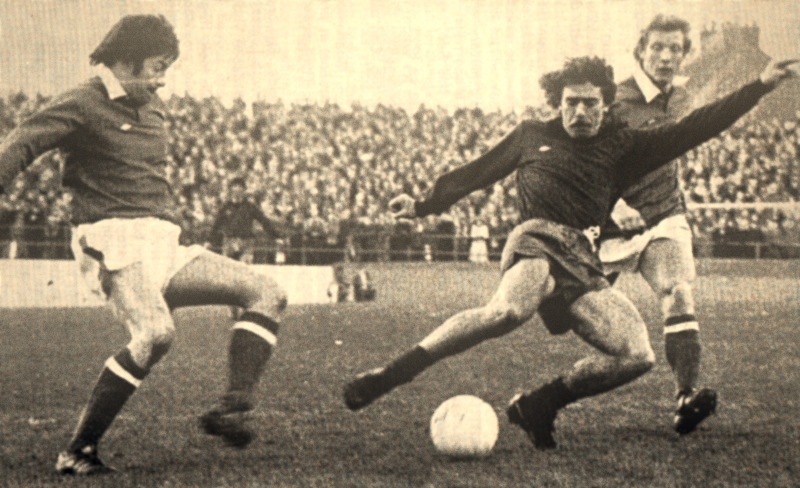 And when Taylor unleashed him on to the startled Third Dlvlsion, Peter repaid his faith in him by scoring six goals in his eight games – enough to bring several First Division scouts to the Goldstone Ground. Now, at 20 and standing five feet seven inches and weighing 10 stone, Peter is hoping he can establish himself even further next season. 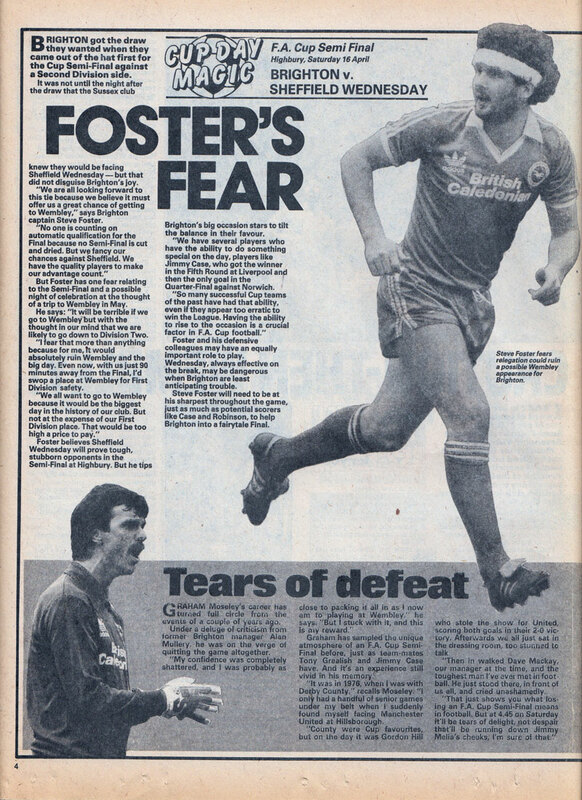 “I got over that problem and scored 20 goals for the reserves – but I never expected my first-team chance to come so quickly, It was a big shock to be asked to take over from Fred Binney. “But now I have had my taste of first-team action I am hungry for more. 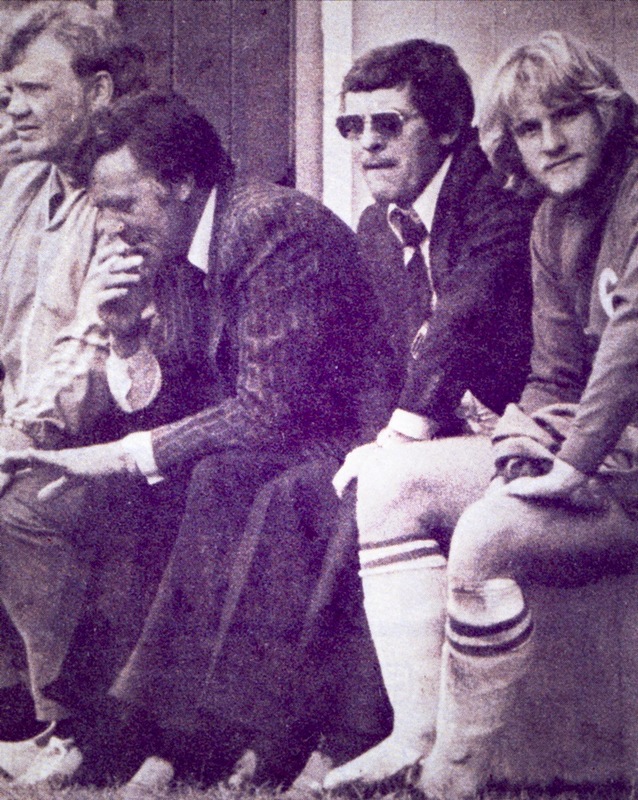 Alan Mullery (centre) has led the club through three years of success. Brighton will push on in the summer with improvements to their Goldstone Ground that will almost double the seating capacity. They plan an extension of their main stand that will make it a double decker and extend it the complete length of the pitch. The South stand will have increased seating and the one open side of the ground will have a roof put over it, providing added comfort for the terrace patrons. Some might claim these moves are long overdue – for Brighton have not exactly had the best facilities in the country. But the booming South Coast club make no apologies for not doing the work until now. Their priorities have lay in other directions – like putting a good team together. “We feel we have put the horse before the cart – not the other way round,” claims Brighton boss Alan Mullery – who has led the club through three years of success. We did not see the point of having a magnificent stadium if you did not have a team worth watching. So all the efforts down here over the past few years – including the year or so before I arrived have been geared to signing good players and putting a real team together. Our results and performances prove we have done that. Now we can get on with the business of improving facilities for spectators. Once the work is done we’ll have around 9,000 seats – and they are badly needed here. For at the moment we have only 4,700. These are all taken by season-ticket holders and there is not a seat for sale on match days. Revenue from those seats is around £150,000. When we get the rest in that will shoot up to some £300,000 – and that’s a nice little nest egg to get in before a season starts. “Things have gone well here in the past three or four years. They are getting better all the time and we intend to make sure things continue that way. No one is sitting back and congratulating themselves on a job well done. As far as everyone connected with the club is concerned the job is only just beginning. To sit back and be satisfied with the set-up is to invite trouble. We are constantly striving to make the club better and better. 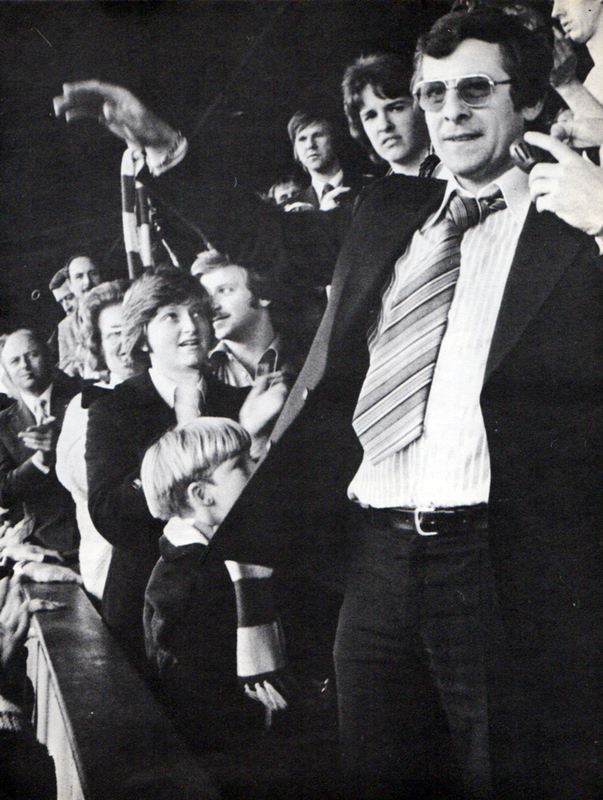 “The Board – led by chairman Mike Bamber – are all progressive men and they won’t allow the club to stand still. Mike showed his intentions when he became chairman by getting Brian Clough and Peter Taylor down here to manage the club. 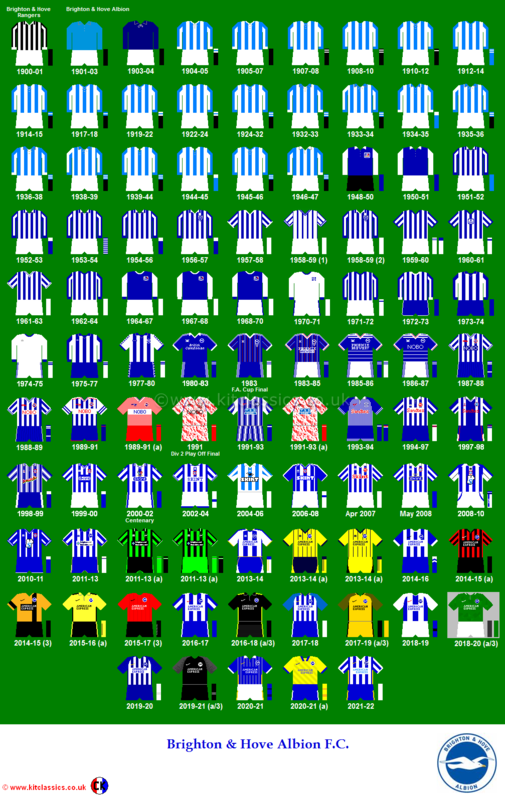 Capturing names like these was a sensational coup for a club like Brighton – who, at the time, had never been associated with men of this calibre. 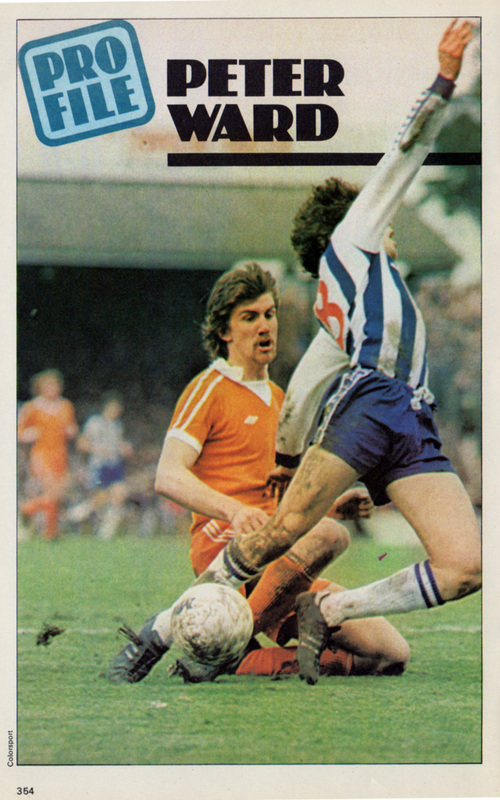 The arrival of Clough and Taylor put Brighton firmly on the map. It aroused tremendous interest throughout the game and I always looked for their results from then on. It’s a far cry from the days when a previous manager, Pat Saward, had to practically beg for money to provide the funds to buy players. He was more or less reduced to carrying a bucket along the seafront and sweated blood to raise relatively modest sums to get fresh faces in. That could not happen now. “I’ve spent half-a-million quid on reshaping the side to meet the challenge presented by a higher grade of football. And there will be more available if I need to spend again. At the moment I’m very happy with the squad I’ve got – and I’m offering new contracts to prove it. In fact two players – Peter Ward and Mark Lawrenson – have been offered contracts for TEN years and that will make them secure for the rest of their lives. But if I need to act to strengthen – to go for someone who can improve the staff even further – I will not hesitate to do it. “I learned a long time ago that you cannot afford to stand still and Tottenham boss Bill Nicholson was my mentor. During my days as a player at White Hart Lane Spurs won trophies galore. But that never stopped Bill Nick from going out and buying big in his constant search for perfection. 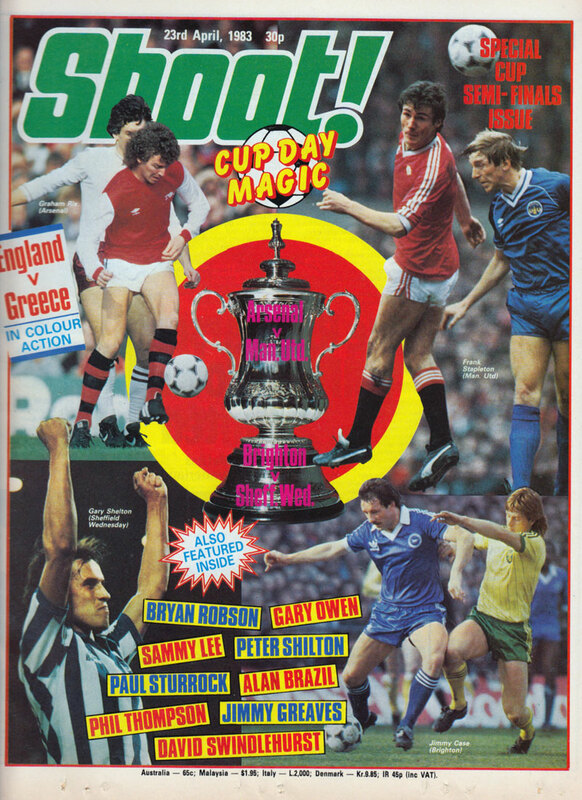 “And Clough and Taylor emphasised the importance of that a few weeks ago, when they spent a staggering million pounds to add Trevor Francis to a squad who had already won the League Championship and seemed strong enough to dominate British football for along time to come. That’s the way you have got to think if you are to make an impression in the game. 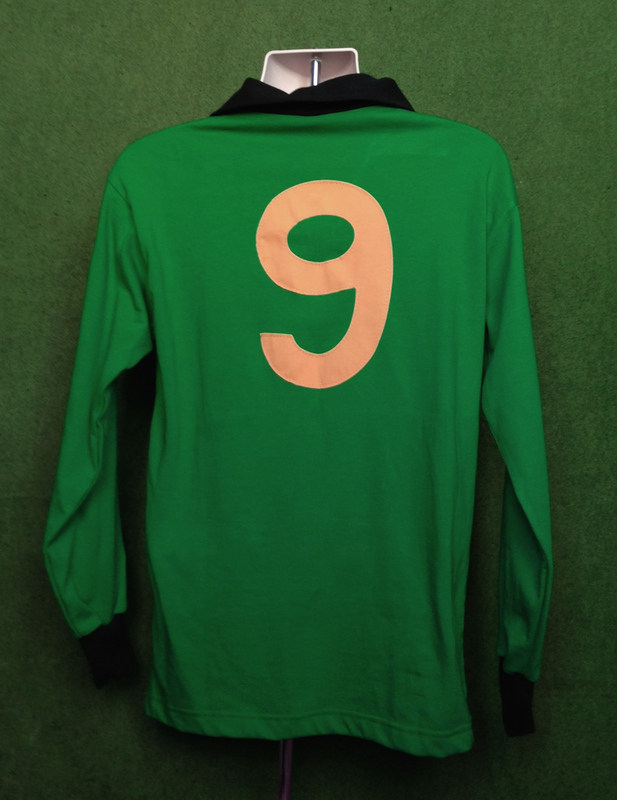 Mullery was always a winner in a distinguished playing career with Tottenham, Fulham and England. He readily admits to being the world’s worst loser. Failure is not a thing he has ever been associated with… nor ever intends to be. And that can only be great news for Brighton fans – who seem set to enjoy an even bigger boom in the future. 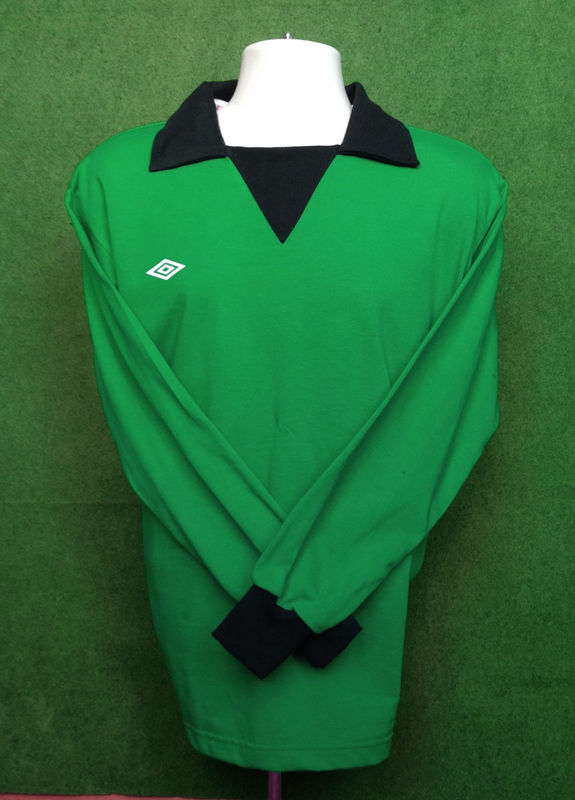 One of the close-season’s most astute signings was Alan Mullery,s move for Eric Potts. 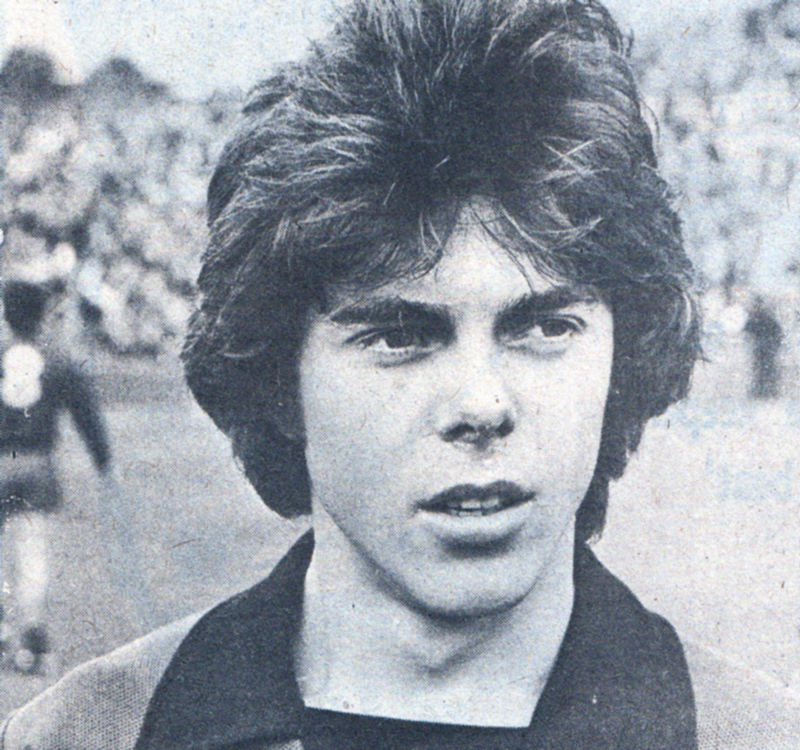 For just £14,000 the Brighton manager whipped away from Sheffield Wednesday one of the most popular players the Steel City has had. Attacking from midfield, the role given to him last season, did not suit him. “I would rather have midfield opponents worry about me,” said Potts. And although he only scored two League goals, a groin injury plus a change of position limited his appearances to twenty League games last term. With over 150 games for The Owls behind him there was some sadness at leaving Sheffield. “‘I’ve had some good years with them .. and got on well with the directors and supporters…you can’t play for them for seven years and not have them in your heart. The supporters made me… they pushed and pushed by letters to the Press and in other ways to get me into the side. “But I want to go places… not sit on the substitutes’ bench like I did eight times in the Third Division last season. The First is my aim and that’s the reason I’m delighted to be joining Brighton. They want to play there, too. “When I met Alan Mullery and the chairman and vice-chairman of the club in June their attitude to the-game was impressive enough for me to want to sign for them… they didn’t have to sell the potential of the club to me. In the close season the 27 year-old, ginger-haired winger spent two weeks holiday in his mother’s house, opposite Everton Football Club, andthen went house-hunting in Shoreham with wife Linda end daughters Jennifer (3) and Deborah (1). They’re likely to enjoy life there for many reasons. 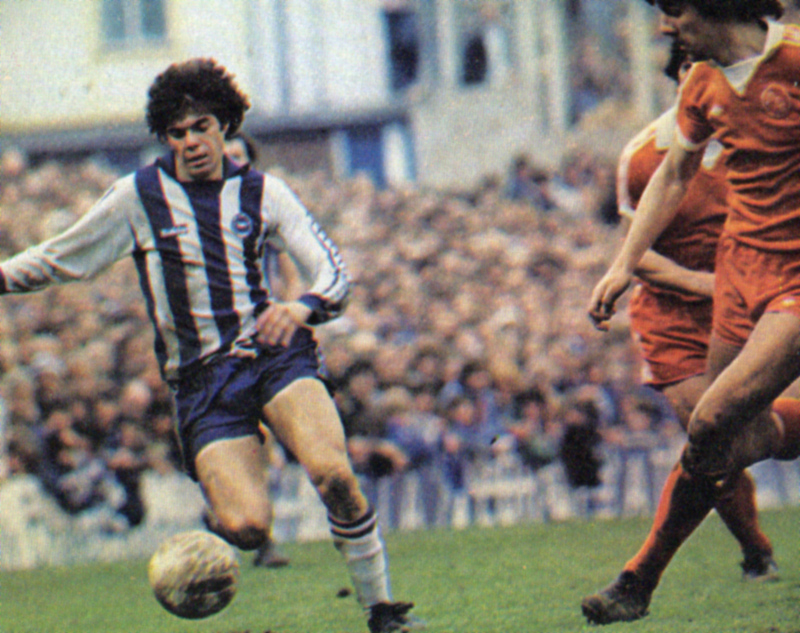 ‘I get clobbered every game,” says Brighton’s star striker Peter Ward. And here’s one time it was worth it. Ward wins a penalty from Blackpool last season. 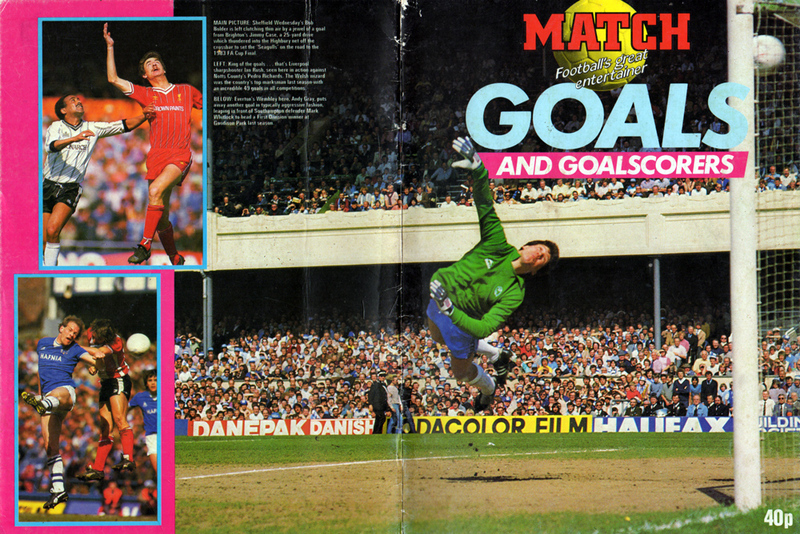 Now and again ‘Match of the Day’ deserts the First Division for highlights of the action from football’s ‘lower reaches’. Sometimes it’s dreary but often it’s a delight – and the producer who took his cameras to Hove on 18 September I976 could hardly believe his luck. Not only did the Third Division match produce the amazing scoreline of 7-2. It also made a star out of an unknown …a lad named Peter Ward. One goal in Brighton’s crushing of York City made Saturday night viewers take note for the chat in the pub at Sunday lunchtime . …a goal scored by Ward. Smoothly, effortlessly, Ward cut inside and danced past several defenders before slamming a right-foot shot high into the corner of the net. It was clear to everyone that here was someone special – his control at speed, his ability to turn defenders and, above all, his precision finishing. And there was expression in his play that made a mockery of the ‘fear element’ that had spread through every level of the game. Yet there was a time when Ward himself was in danger of being a victim of the ‘too small’ syndrome. ‘I got no encouragement at all at school,’ says Peter. ‘Just before I left they came round asking everyone what they wanted to be. His football was played in local parks until Burton Albion took his talent into the Premier Division of the Southern League. 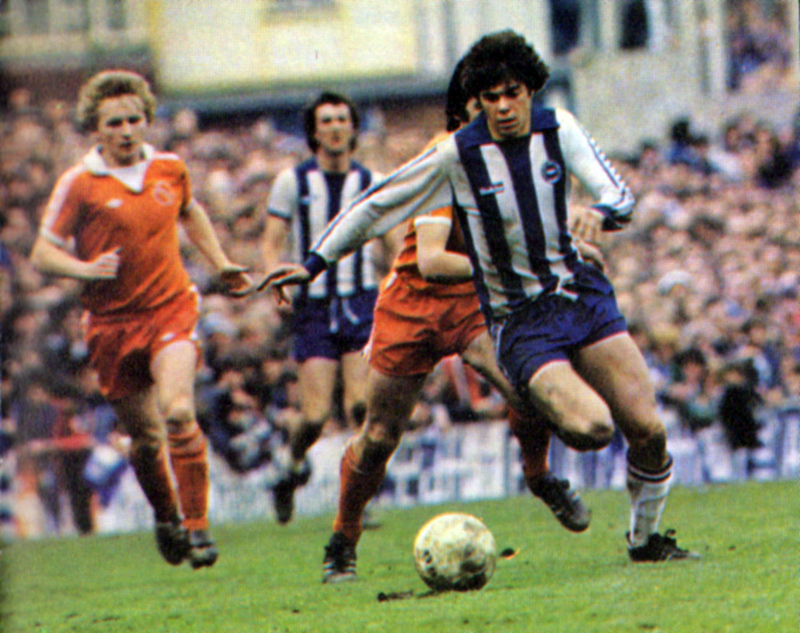 Little over a season later Brighton made the offer of full-time football. A quiet start to his pro career might have been expected – certainly not the 36 goals he scored as Brighton scorched into the Second Division. Almost inevitably the goals dried up a bit the following season and Brighton paid out over £200,000 for Teddy Maybank to take some of the load off Ward. Brave as well as skilful. . .
Ward keeps close control despite the attentions of a defender who dwarfs him. Ward says: ‘I’d played alongside Ian Mellor for a season and a half and we’d built up an understanding. When they bought Ted to replace him we didn’t start off too well. I was going through a bad patch and he was trying to justify his fee. ‘But, all of a sudden, it just clicked, and we played really well together for four or five games. 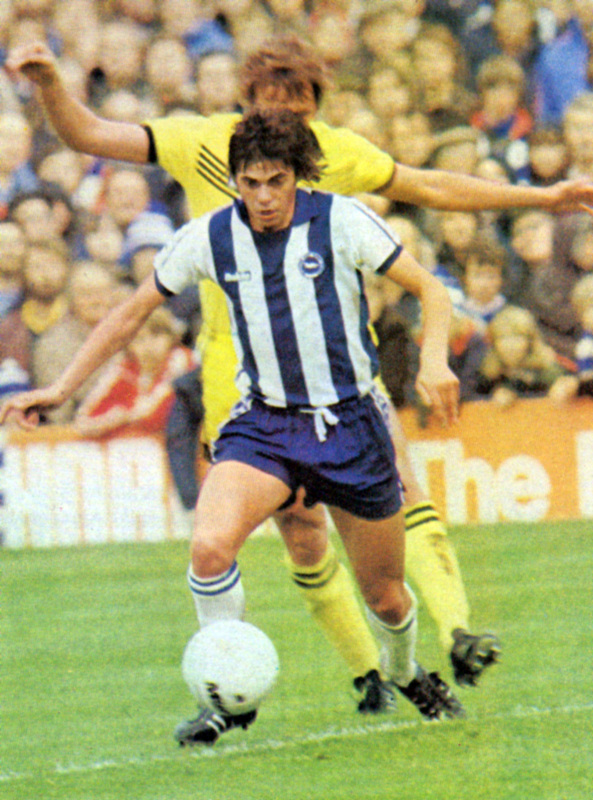 Then he was injured and had to have a cartilage operation.’ Brighton went straight back into the transfer market and Malcolm Poskett became Ward’s next striking partner. These upheavals did not help Peter’s play and he finished the season with 17 goals – plenty for most players but well below the standard he had set himself. He accepts the stick he takes every week, too. ‘It doesn’t matter who we’re playing. I still get clobbered all the time. They all hit you hard. The only way to get back at them is to play well or score.’ Peter remembers in detail the goals he scores, but he has no set plan for finding the net. ‘I like the ball played to my chest or feet, in and around the box. It’s pointless me trying to turn a defender on the half-way line – I can’t shoot from there! Indefinable instinct gets him into scoring positions in crowded areas, but control counts just as much. ‘I’m always working on my close control. You can never be too good. I’m always trying to improve, always sharpening up.’ After training you’ll see him practising shots on the turn with an apprentice marking him. Last season’s lean spell helped in terms of attitude. All the Brighton heads went down a bit when Spurs pipped them for promotion on goal difference last season. But they hadn’t. Disappointment was acute.